Every year the number of mobile apps continue to rise, with the entire mobile app industry predicted to bring 188.6B USD in revenues by 2020 (a 271 % increase from 2015). With this in mind, it’s no wonder that 90% of CMOs think that user experience will be part of their strategy by 2020. However, there’s still a lot to be done when it comes to keeping users engaged throughout the purchase funnel. Imagine browsing a pair of shoes in a shopping app, then not going through with the purchase due to reasons like distraction, not being convinced, so on. If your shopping app runs retargeting campaigns, you’ll shortly get an ad for that same product in another app and possibly click it. Where do you expect to be taken? To the homepage of the app, or to the purchase page of the shoes? We’re guessing it’s the latter. If you end up on the home page, chances are you’re not going to go looking for that same pair of shoes, especially if you weren’t sold on them in the first place. However, if you’re brought straight to the purchase page, you are more likely to convert. A deep link is comparable to a web link (a URL) that takes the user directly to a specific page. While a link takes you to a specific webpage, a deep link is a specific link that creates more entry points for apps. 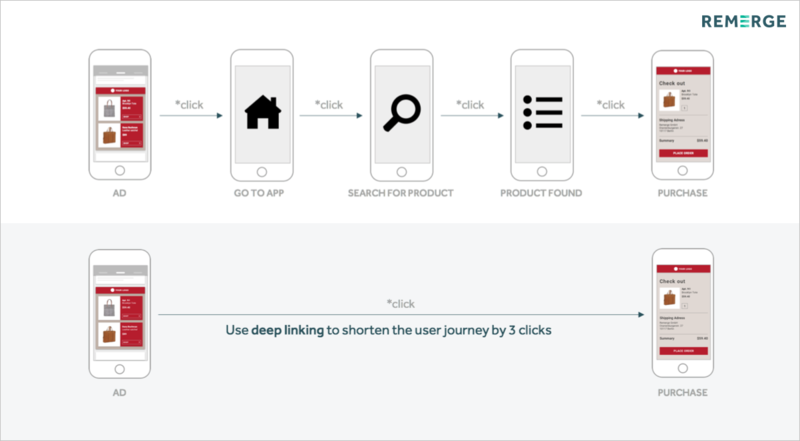 Deep links assist with the transition from a call-to-action outside an app to a specific place within the app. Be it the page the user dropped off, the checkout page, or the subscription page, deep links can be placed anywhere the marketer wants the user to reenter the app directly upon clicking, anywhere but the home page (as context is lost here). These can be used with different retargeting methods ranging from ads to push notifications and email marketing. Is it really worth the effort to set this up? Yes, absolutely. Deep links are vital in achieving your revenue target. The first step is to identify the re-engagement entry points within your app. These can vary depending on your vertical. Look at the user funnel in your app to identify which points are key conversion events. You want to create deep links that lead to these precise points. E-commerce: deep link to a specific product or product category. If the product was advertised, a user can click on the product ad and have it directly added in their basket. Gaming: deep link to a direct spot in-app or in the game shop. The user can immediately buy the next item needed. After mapping out all conversion events, you’ll want to implement deep links as part of your tracking links. Attribution providers will usually offer support with this step. A note regarding deep linking in Apple: With the introduction of iOS 9, the universal link has become the new standard for deep linking in Apple devices. The universal link makes the user experience more seamless, while sharing data more securely. Check your attribution provider’s content to find out how to set up universal links within tracking links. Most of them already have a market solution. Once you have your deep links in place, speak with your account manager to make sure your deep links are properly set up in your tracking URLs. 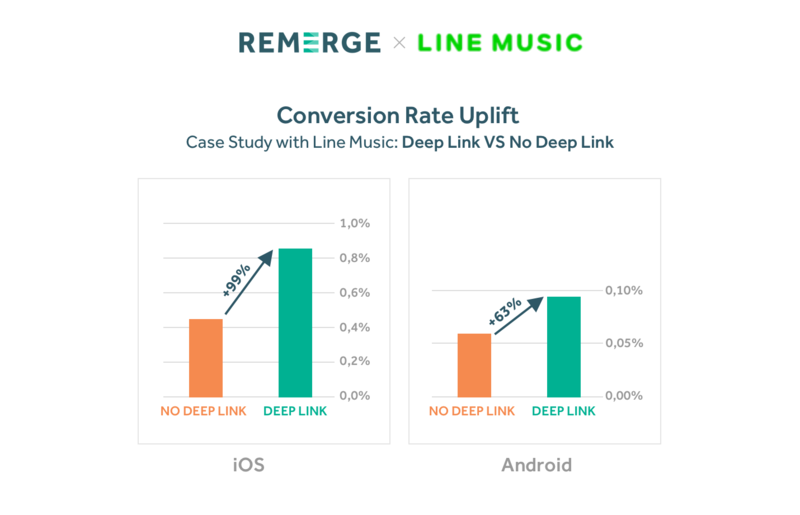 LINE Music, a Japanese music streaming service, ran an A/B test campaign to test the efficacy of proper deep linking. Ads originally redirected users to the home screen, where they quickly became distracted by browsing through songs. The test used deep links to take users directly to the subscription page. Conversion Event: Users were shown an ad which brought them directly to the subscription page via a deep link. The test and control group were shown the exact same creative with the same message and CTA. However, one brought users to the home page (control), while the other brought users to the subscription (test). The result: an uplift in conversion by 63% in Android and 99% in iOS. The same concept illustrated above, with LINE music ads and the corresponding purchase page. Mobile solutions are needed in a now mobile world. A wholistic approach gets the best impact. Understand your user, have the right creatives, and set up the proper links. To increase your conversion rate, map every conversion event and pair it with a corresponding deeplink. 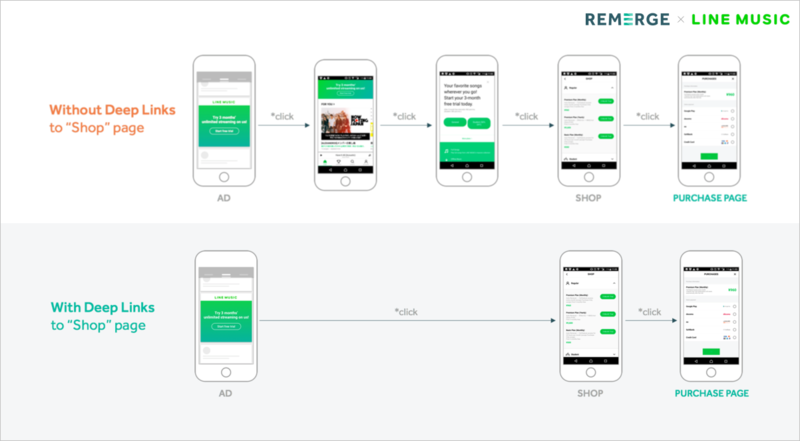 If you’re interested on retargeting with Remerge, we’ll help you define the right strategy and the technical requirements to get the best results.